The Knowledge Retention process consists of 6 generic steps. In many organisations crucial knowledge is held in the heads of a few ageing experts, and when they retire, that knowledge is lost. In some Western organisations, with large baby-boomer populations, up to 50% of the corporate knowledge will depart within the next decade. Unless something is done, the organisation will suffer a form of corporate Alzheimers; progressively losing its intellectual capacity until it fails to function. 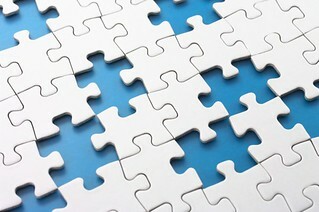 Or like a jigsaw progressively losing its pieces until the picture no longer makes sense. Knowledge retention is an approach to dealing with the risk of knowledge loss when senior experts retire. In high-reliability organisations, this knowledge loss presents a serious risk and is addressed systematically and routinely. The Nuclear industry, for example, has a complete and well documented approach to Knowledge Loss risk assessment. When your organisation has a full KM framework in operation, this risk is mitigated as the expert knowledge should be already dispersed within the system and available to other staff. However you may still need to run additional activities just to capture the unique tacit knowledge of the most experienced experts. One of the oil majors, for example, despite their complete and well embedded KM approach, still conducts retention exercises for about 5% of departing staff to capture the last pieces of tacit knowledge that may have escaped the system to date. Where your organisation has no embedded KM framework, then knowledge retention becomes a necessity. Analyse the risk of knowledge loss through retirement, and high-grade the experts to address. You will not have enough resources to retain knowledge from all experts, so you need some method to identify where the risk of loss is greatest. The Nuclear screening approach is as good as any (although there are variants) and you or your HR department need to run this screening on a regular basis. Engage the individual experts and their line managers in the retention process. Knowledge retention, done properly, is a resource-intensive process, and both the expert and their line manager need to understand the process, accept the importance of retention and the risks of not doing it, and agree to set the time aside to take part. When KM is at its infancy in an organisation this step is crucial and takes a lot of explanation. Once KM becomes embedded and retention is routine, this step becomes more efficient; merely involving a stated agreement between all parties. Part of this step also involves assignment of a facilitator to work with the expert, and the identification wherever possible of a successor to whom knowledge will be transferred. Scope and plan the retention process. Even once you have high-graded the expert, you still need to high-grade the knowledge topics you want to address in order to focus on the knowledge topics that are unique to the expert, and are crucial for the future running of the organisation. The facilitator (and others) work with the expert to map out the knowledge topics the expert knows about, to prioritise these, and then to decide how each topic will be retained and transferred. Document and structure the knowledge. Although much knowledge will have been directly transferred to successors and others during these activities listed above, much can also be recorded in audio, video and text. The facilitator and/or successor will need to synthesise this source material into a useful and usable form - a knowledge asset for future reference, or training material, or a series of wiki articles, for example. Embed the documented knowledge within the organisation knowledge bases. The wrong thing to do is to build a standalone knowledge asset based on a single expert, The right thing is to disperse and embed that knowledge into the existing knowledge basis of the organisation - the wikis, the community portals, the training sites and so on. It needs to be integrated with what already is known, and put where the knowledge seekers will come looking. These 6 steps, run well and routinely, will help address the risk of knowledge loss, and help stave off the onset of corporate Alzheimers.